VIS-A-VIS extends its expertise of hand embroidery to hand-guided Embroidery. The same contemporary inspiration for its collections is used, choosing between traditional, romantic and modern designs, colors and harmonies. 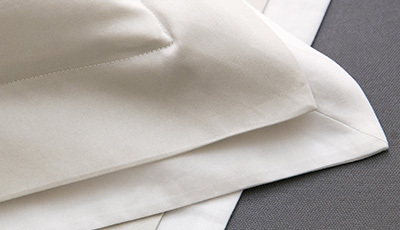 Lightly graphic, often reduced to the simplest expression describes our classic and timeless bedlinen. 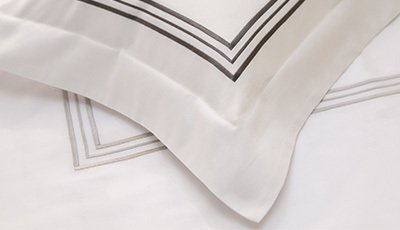 With or without hand guided embroideries, with or without bands or chords, our bedlinen is distinguished by the simplicity and perfection of our finishes. Like the hand embroidery production, VIS-A-VIS incorporates a tailoring atelier in France that can fulfill less intricate orders with shorter lead times. The exceptional quality of finish, equal to those produced by hand, is still retained. Our bed linen is inspired by the sensual feeling and deep nuances of nature itself.